I tried to SPAM flag that post Buddy, but didn't see "Agrees with wanderingjew" as an option for the reason. We made it back to LC's Hamburgers (it's been said before but needs to be emphasized: NO relation to LC's BBQ) tonight. LC's was on the original list for the April Crawl but had to be 86'd at the last minute due to fatigue and full bellies. We scheduled LC's and Hayes Hamburgers back to back on Saturday night. Once we accepted the reality of too much food in one day, we decided to keep Hayes and save LC's for the next KC Crawl (and there will be one eventually). So tonight, Mrs. Roadhouse and I made LC's a part of our personal Crawl, and I'm glad we did. There are several KC Burger joints serving a similar style of the classic Smashed Down Griddle Burger. The well known Town Topic, Hayes, LC's, and local chain Winstead's (Calvin Trillin's favorite). 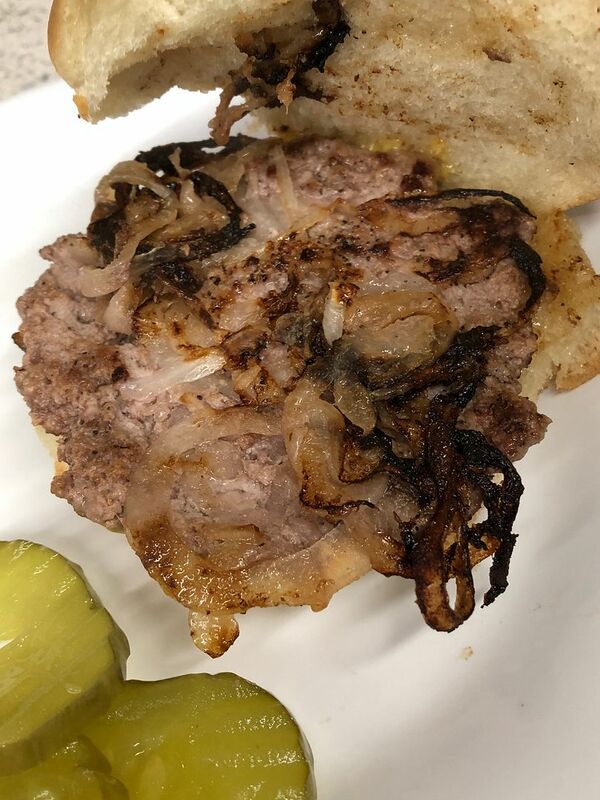 Some versions include thinly sliced onions mashed into the meat as it hits the griddle, not unlike the Oklahoma style Burger. Others are just meat, but the onions, grilled or raw, figure prominently into the condiment arsenal. LC's falls into the second category of "onions added after the fact". Some of you may remember, after the Crawl ended and we all headed for home, wanderingjew stuck around an extra day or two and checked out some other places. Among them LC's, who he declared superior to all the others. I'm pleased to report he was, for once, FINALLY correct! I ordered a double CheeseBurger with Grilled Onions and it was fantastic! Great flavor, fabulous texture and appearance; it was the ideal upon which all other Smashed Down Burgers should be modeled. After we finished eating, Mrs. Roadhouse immediately slathered up with Purel to get the grease off. I, being a more sentimental soul, just used a napkin or two to wipe down, preserving the grilled onion and beef perfume for the ride home. In spite of my admission that LC's was the better Burger, I still defend the decision to drop them and keep Hayes for the Crawl. Architecturally, LC's is more of a standard fast food building; sterile, generic surroundings with limited seating. Hayes has character and soul. If we'd opted for LC's we would have missed the experience of slowly taking over the entire restaurant, then placing all our orders at once and watching the grillman's artistry as he juggled the hot flat iron space to churn out our food. Overall, Hayes provided a fuller Roadfood "experience" that LC's lacks. That said, LC's should be a top priority for anyone visiting KC on their own. P.S. I may have offended a couple of folks innocently enjoying their LC's Burgers while I was ordering. I asked the counter girl to describe three specialty Burgers listed on the menu, the 911 Burger, the Peggy Burger, and the Double Justin Burger. 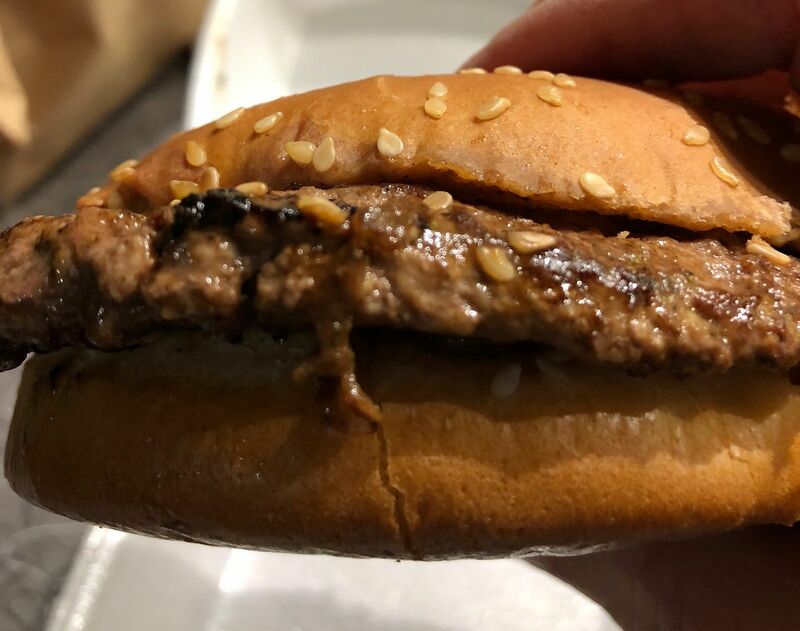 She started out, "Well, all three are covered in ranch dressing..."
"Stop," I interrupted, "Any Burger with ranch dressing is an abomination, and anyone who orders it that way should be dragged out behind the building and fed to feral dogs. Just give me a Double CheeseBurger with Grilled Onions, ketchup, mustard and pickles." As I turned and headed to my table I noticed a husband and wife trying to enjoy their Burgers. It was fairly apparent both sandwiches were oozing a viscous, white substance that could only be ranch dressing. Soon after i made my comments, even though they hadn't finished their meals, they got up and left. So if they're out their reading this (Hah! ), I apologize for ruining your meal. You should have at least been allowed to finish your Burgers before you were dragged out to the feral dogs. I wish I had enjoyed my burger at LC's in October that much, or really much at all. Maybe because I arrived 10 minutes before closing? Maybe because I was still full from LC's Barbecue and Betty Rae's ice cream? Maybe because I was expecting a setting more like Town Topic or Hayes? I don't know. I enjoyed the burger I had the next night at Hayes much more. I'm certainly willing to give it another try at the next KC crawl. This was my burger at LC's. This was my burger at Hayes. I liked the texture and the flavor much more at Hayes. Also, it was truly smashed. I find it difficult to rank LC's or Hayes one over the other because, as I tried to express (maybe unsuccessfully), each has their own endearing qualities. As you rightly point out, LC's lacks any kind of Roadfood charm. But for my money LC's makes the better Burger by more than a narrow margin. OTOH, Hayes' history and ambiance definitely adds to the total experience and proves that atmosphere and attitude can enhance the flavor of the food. A busy day today as we met some of Mrs. Roadhouse's relatives at the original location of The Peanut. CNW and I wrestled over including this classic dive bar on the Crawl itinerary, but couldn't squeeze it into the already overloaded schedule. They're best known for their Hot Wings, so we ordered a dozen and a half with sides of Blue Cheese. The Peanut's wings are massive. They allegedly came from chickens, but I wouldn't be surprised if there was some eagle, or even pterodactyl DNA lurking in there. They were slathered in a pleasantly tangy hot sauce with a stack of napkins nearby. Knowing we weren't interested in pretending to eat healthy, not a single stalk of celery was in sight. These were excellent wings served at a great location, but no regrets for dropping them from the Crawl. We'll just save them for the next gathering. Dinner was at Grinder's Pizza, a better than average bar & grill. Decent food, but not worth discussing further. Tomorrow night is Jewish Christmas Eve! Looks like we'll be eating Thai while y'all are at 9:00 Mass. We're off to Stroud's for Fried Chicken tonight. Unless they've changed everything, I don't expect there'll be much to write about. Maybe when we get back to our KC home base later tonight I'll report on the two new-to-us BBQ Joints we've checked out in the last 24 hours. Once we get back to Chicago, I might even post a jaw dropping photo or two of the gorgeous sampler plate we just had for lunch. So you're not going to do the Chicago transplant guy I so hopefully informed Mrs Roadhouse of? I am indeed disappointed. I’m really looking forward to those photos (and the names) of the new-to-you places. Apologies to 1bbqboy for missing (so far) Chi-Town Original. We drove right past it as we were headed to one of the aforementioned 'Que Joints. We may still end up paying them a visit if we somehow find ourselves short of local places we need to hit before leaving town. In other words, sorry, it ain't gonna happen. This is especially regrettable because it just feeds wandergingjew's feverish insistence that we must not EVER eat anything but local specialties when traveling to places known for specific regionally appropriate foods. Sorry, but pounding down nothing but Coney Dogs over some future three day visit to Detroit does not appeal. Or sit well with even my loose definition of good dietary health. Anyhoo, we recently checked out two Greasehouses, heretofore unknown to me. Pullman BBQ is so named because it features an actual Pullman train car built into its vintage building in downtown Parkville, MO. It's pretty cute, with above average 'Que coming out of the kitchen. Pullman's Pitmaster is part of a new generation that adheres to the practice of making just enough food to cover your customers for a single day. No leftovers means no rollovers of second rate 'Que for the next day. By extension it also means anything served toward the end of the day might not be of the same quality as food plated during peak hours. Dry, tough, less than flavorful meat is not uncommon in those situations. So when we walked in a half hour before closing we were prepared to make certain allowances in judging the food. As it turned out, that was completely unnecessary. Our three meat combo platter of Brisket, Chicken, and Sausage was moist and tender with solid flavor. Sides of Cheesy Corn and BBQ Beans were very good. Mrs. Roadhouse enjoyed the creamy cole slaw. I'm not a big fan of that style of slaw even in the best versions, so will not offer judgment. All I can say is, if this is what they're serving at the end of the day, the lunchtime portions must be incredible. As mentioned above, we passed up an opportunity to chow down on Chicago Style Hot Dogs and Italian Beef Sandwiches in favor of Smokin' Joe's Bar-B-Q in Olathe, KS. We were meeting one of Mrs. Roadhouse's best friends who lives in the area. She recommended Joe's (no relation to Joe's KC or any other 'Que joint named after any other "Joe" in the known universe), describing it as a "hole in the wall" operation. As we headed west along 135th street, driving past an unending string of recently built suburban malls, I thought, "There aren't many walls left here in which a "hole" restaurant could reasonably hide." Suddenly, suburban sprawl gave way to an older part of town, and sure enough, there was Joe's, a smallish free standing structure, typical of many other area BBQ stands scattered around KC Metro. The clear and present aroma of smoke as we got out of the car assured us this was the real deal. The menu followed the same path as almost every other old time Greasehouse in town. Unlike Pullman BBQ, Joe's sits squarely in the Old School generation of KC 'Que. Again we went for the combo platter, this time getting a massive plate of Ribs, Burnt Ends, and Chicken. Mrs. Roadhouse's friend added a pile of Sausage from her lunch to the already piled high plate. The two Ribs included both the bones and tips, making it look like a half slab. Generous piles of Burnt Ends and thinly sliced smoked boneless, skinless Chicken Breast were buried underneath. Just barely visible portions of BBQ Beans and Mac & Cheese poked out off to the side. We were already overwhelmed when a huge basket of Fries was plopped down next to the platter. That's the photo you'll see when I get back home and get around to posting it. Again, everything was top notch, although not the cutting edge 'Que we've seen at newer places like SLAPS and Q39. But frankly, that's not a bad thing. Not sure about today's meals. Plans are still developing. More when we figure it out. We wrapped up our Holiday trip on two high notes. On Friday night, most of our old American Royal BBQ Sauce Store gang got together for a farewell dinner before we left town. Dan "Der Saucemeister" Bonderer suggested Chelly's Cafe, a strip mall Mexican joint in the Waldo neighborhood. I was leery to say the least, but everyone else in the group seemed to think it was a pretty good choice. We started off with some delicious and generous Margaritas. Nicely tangy with a good hit of Tequila. One giant goblet with two straws turned out to be enough for Mrs. Roadhouse and me. I'd been snacking all day and didn't want a full entree, so settled for a tall Shrimp Cocktail. Chelly's does a very nice version with an abundance of shrimp, well balanced with small chunks of avocado in a sweet tangy tomato sauce. It needed a couple of shots of hot sauce and a squeeze of lime to meet my particular taste needs, but it was a solid base on its own. My friends were all eager to share a taste or two of their entrees in exchange for a shrimp. I got to try Chelly's excellent Carnitas that compared favorably to what we get here in Chicago at Don Pedro's in the heart of the Pilsen Mexican neighborhood. They were rich, moist and full of porky flavor. I think my favorite though was the Chile Verde. I love a good Tomatillo Salsa and this was one of the best I've had, with big chunks of pork swimming in it, alongside the requisite beans and rice. KC is famous for 'Que and Fried Chicken, but Mexican food is an underappreciated third candidate for "regionally appropriate" dining in the area. Chelly's Cafe ranks up there as one of the best in the category. Our second high note came about 60 miles east of town as we headed home Saturday. We'd stopped at Dempsey's BBQ in Concordia, MO as a necessity during an impromptu road trip back in October. We liked it so much we decided to try it again to make sure it wasn't a fluke. Once again, our Sampler Plate was overwhelming. A giant Pork Rib dominated the plate with piles of Pulled Pork, Brisket, and a full smoked Chicken Breast buried underneath. All the 'Que was top notch and worthy of a visit by anyone traveling on I-70 either to or from KC. Sides of BBQ Beans, creamy Mac & Cheese and Slaw all lived up to the standards set by the meats. Even after splitting everything, we had a carry out container that made the trip home to Chicago. That's it for now; back to real life. My New York friends are still completely stunned that Rhode Island is comprised of Italians and Portuguese, thinking that it's primary WASP and Irish. My Mother called me a WASP. Cant help my heritage! Time to finally finish this KC Trip Thread. After awakening from my Rip Van Winkle styled nap, I was presented with a gallon of Brobeck's ham salad the other day. It's been a ham salad kinda week with ham salad sandwiches, ham salad and crackers (the chips didn't survive but did put up a fight), ham salad on a spoon...and just for John, a ham salad facial! Feeling like I put in the missing the piece of the puzzle together, am completely refreshed from my nap, and have younger looking skin than any of my Canadian neighbors! Thanks Buddy and the Mrs....couldn't have done it without your kind delivery!